In many countries in Europe and beyond, large psychiatric and social care institutions are still the main care setting for those deemed to require long-term support, despite years of stated policies in support of a process of deinstitutionalization. Many of these institutions are run down, poorly maintained and, too often, the setting for practices that are inhumane and antithetical to safe, effective and high-quality care. The single most common recommendation in the reports from 98 long-term facilities that were assessed in 2017 concerned the need to train institution staff and other stakeholders on how to realize rights-based and recovery-oriented mental health care. specialized topics on recovery and service improvement. 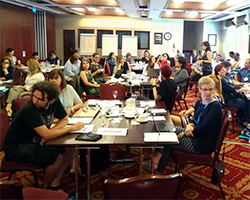 The participants are now in a position to implement the WHO QualityRights approach by training local health and social care professionals in institutions. They can also evaluate the impact of service changes with a view to engendering policy dialogue and legislative reform concerning the rights of people with psychosocial and intellectual disabilities.